Dress To Impress is a Registered 16.2 HH 11 Year Old Bay Hanoverian Mare with many show miles on her record which you can view on the USEF website using her #5192323. She has been to Gulfport, Lake Placid, Harrisburg and Charleston with multiple Champion Winnings from each competition. She was the hack winner at the M&S Finals in 2017 out of 55 other competitors! 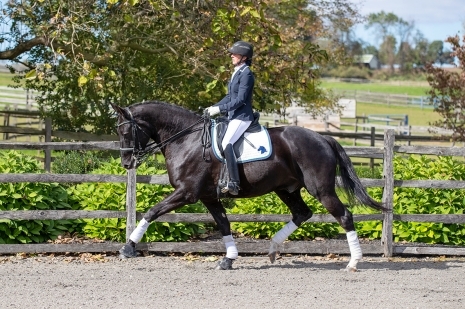 She is currently showing in the 3’ Divisions and a solid prospect for the 3’3” Divisions. Dress To Impress is not your typical mare, not only is she very classy with a large floating stride she is eye catching, very willing, sweet and an uncomplicated ride that she can easily pack around a Junior or Amateur rider and be in the top three every time every ride. She ties, clips, trailers, stands great for farrier, vet and dentist. Currently UTD on Coggins, Shots, Deworming, Shoeing and Dental care. She has auto lead changes and the scope to move up from the 3’ Divisions. We are sadly offering her for sale due to her rider going off to college. Don’t miss out on this incredible opportunity with a horse that can take you through the levels of riding and showing!